Budgettaxi does not only bring travelers onto there destination, but can also transport personnel or clients from your company. This will always be private transport. 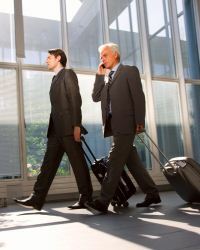 At arrival on an airport the driver will wait for the client at the designated spot with a name plate with our logo on. If desired, the driver can also wait with a sign with your logo on. For transfers at a high level you do not have to do much. You tell us what you need and we do the rest. Result: More service in less time.